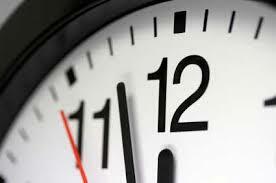 Tis the Time for Tea…. On the twelfth (and final) day of Starbucks 12 Days of Bonus Stars (December 15th) you will receive either 1,2,3, or 4 Bonus Stars with the purchase of any Handcrafted Tea Drink after 2pm. Personally, I am not a huge tea drinker, however, I know that some far prefer tea over coffee. 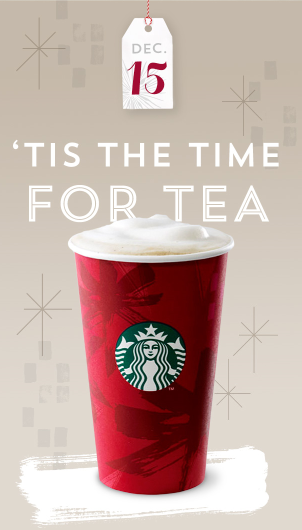 I called Starbucks to check and it seems that today’s offer basically includes everything on the tea menu. From the brewed teas (Earl Grey and China Green Tips) to the tea lattes (such as Awake Latte and Vanilla Rooibos Latte) to the delicious shaken teas…. all are included. 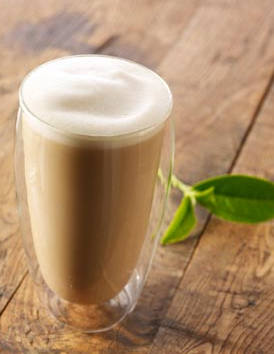 This might be the perfect chance for you to try a twist to the regular Chai Tea Latte found on the Starbucks Secret Menu. 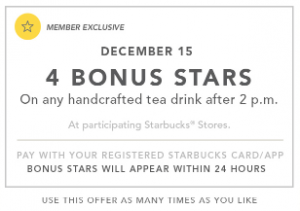 11 Comments on "Starbucks 12 Days of Bonus Stars – Day Twelve"
Anyone gotten any more Starbucks bonus stars offers lately. I received an 8 star offer if I purchased any holiday beverage, any holiday treat, and any breakfast sandwich before December 21. I also received one for 2 bonus stars for any espresso drink after 2 p.m. from 12-19 to 12-21. These are better offers than most of the ones I received during the 12 days of bonus stars. I got the 8 star offer too. I did the required purchased and NO stars are on my account from it. I called their card line and the gal told me she’d put them on my account. Two days later, and they STILL didn’t show up. I am not happy. I usually don’t waste money on breakfast or holiday baked goods there. I want my stars! I think I would just call again.I have had nothing but success when dealing with Starbucks customer service. Sharing your disappointment that the Stars never showed in your account should do it. I have the e-mail too, it says at the bottom of the e-mail “If you complete the challenge, your Bonus Star code and redemption instructions ill be e-mailed by 1/9” So no need to call customer service until January 10th if you still haven’t received the redemption e-mail. Thanks for the update JB! Well, it’s past 1/10 and I, too, haven’t received my email for the drink/treat/sandwich bonus star promo. 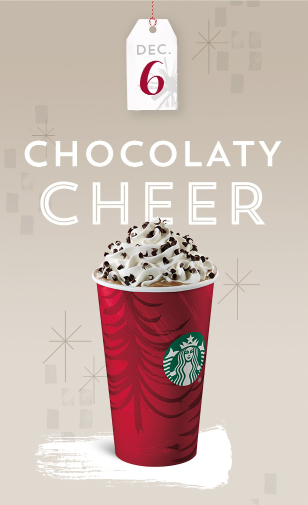 Come on, Starbucks… If you’re going to promise stars via email, send the email! I think they are really slow on this sometimes. I know the last time I did a promo for visit x number of times and get x number of stars took about a month after the promised email date before they sent it. Great on ideas… slow on execution at times. I received my email late last night for the 8 bonus stars for the three purchases. I received my code at about 8pm last night and I entered it and this morning they were added. If you didn’t receive it now I would email them in case they didn’t count something properly. I got the 8 star offer but it said the code would be mailed to me in early January if I completed the purchases by 12-21. On another note, I went in today to get an espresso drink after 2 for the 2 bonus stars. Ordered a latte and was given a frappuccino. Last time I ordered a cocoa and received a mocha so missed out on my bonus stars. This time, I paid more attention and corrected it right away. Not sure how frappucino sounds like latte unlike cocoa and mocha sounding some familiar. I understand the staff is busy, but this is two mistakes at the same store in a relatively short time. Other than that, it is a great location with great staff.